This article will help you understand how you can create, edit and manage budgets in QuickBooks. This easy-to-navigate budgeting feature is provided with QuickBooks online plus and advanced. With Budgets, you can easily plan your business which makes you stay on top of your expenses and revenue. The QuickBooks support team will guide you on how can make informed decisions for your business by simply comparing your budget with the actual report. 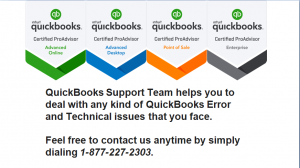 For direct assistance with budgets, contact QuickBooks support @ 1 (877) 227 2303. You can create a budget anytime, but you must be an administrator with all access rights. You would require access rights to create, edit or delete budgets in QuickBooks. A user needs to make sure that the fiscal year settings are accurate since the budget starts with the first month of your fiscal year. 1. From the Toolbar, select the gear icon. 2. Under Your Company, click on Account and Settings (or Company Settings). 3. Click on Advanced that appears in the left menu. 4. Verify the setting for the first month of the fiscal year In the Accounting section. You can edit the settings by using the pencil icon given on the screen. 5. Click on Save to make the changes. 6. Once you verify the settings, click on done. After verifying your fiscal year settings, you need to review and ensure the accuracy of the data you plan to base your budget on. Either you can use the previous year’s amounts of data from the current fiscal to base your budget. Using a historical Profit and Loss Detail report, you can ensure that transactions were assigned correctly in the past. You can customize the report to display the previous fiscal year’s amounts instead of a transaction report of the current fiscal year, which is displayed by default. How to customize a Profit and Loss Detail report? Follow the steps given below to customize a Profit and Loss Detail report. 1. Go to Reports from the left menu of QuickBooks. 2. Locate your Profit and Loss Detail report and open the report. 3. To use the previous year’s data select Last Fiscal Year from the Report period drop-down list. Accept the default setting of This Year-to-date if you want to use data of your current fiscal year. 4. Click on Run report. The report will be displayed with the data from a specified fiscal year. Use this report to verify the transactions on which your budget plan was based. Once you verify the information, the next step is to create your budget. The Budgets feature provides you guidance while creating your first budget. 2. Choose Budgeting from tools. 3. Choose to add a budget. 4. Enter a name for your budget. 5. Once you name your budget, select the fiscal year From the Fiscal Year drop-down list. 6. From the Interval drop-down menu, specify whether the budget is Monthly, Quarterly, or Yearly. 7. If you want, you can specify whether to automatically enter data from the current or previous year into the budget. From the Profile data drop-down list, and specify the year to use. 8. If you want, you can specify whether to split the budget by Class, Customer or Location .use the Subdivide by drop-down list, to specify what class, customer, or location to add to the budget. If you are unable to make these changes, you can consult QuickBooks Technical Support Number @ 1 (877) 227 2303. 9. Once you are done click on Next. 10. Despite using Prefill data option, you can also enter data into the table, using decimals for cents or fractions of a dollar. The amount you enter can be updated anytime. This will create your budget and it will be listed in the Budgets window. • Budget Overview: it provides a Summary of budgeted amounts for a specific budget. • Budget vs. Actual: it provides a Summary of budgeted amounts versus actual amounts along with their variances and variance percentages. 3. Look for the budget you want to view, email, print, or export. 4. Select Run Budget Overview report or Run Budget vs. actuals report from the action column to run the reports. 5. On the Report, page, select the action you want to perform. Choose the Email or Print icon and, in the Print, email, or save as PDF dialog, specify whether you want to send an Email, or Print a copy of the budget. You can also save a copy of your budget by choosing Save as PDF from this dialog. 6. If you want to export the data in your budget click on the Export icon and select Export to Excel or Export to PDF. Choose another budget from the drop-down list to view, email, print, or export to another report. You will get the budget report printed on a single page no matter how many number of rows and columns are there. You can also export the budget report to excel spreadsheet. How to Edit copy or delete existing budgets? Your existing budget reports are not overwritten or affected by creating new budgets. 1. From the Toolbar select the gear icon. 3. Select the budget you want to edit. 4. Choose Edit from the action drop-down to edit the selected budget. 5. Edit the budget name or the budget amounts respectively. 6. Click on Save and close to make the changes. The updated data will be reflected in your budget. How to copy a budget? You can create a new budget by copying your existing budget’s amounts. This is helpful when previous fiscal year information is used to create a new one. Follow the steps to copy a budget. 3. Choose a budget you want to copy. 4. Click on Copy option from the action column. 5. Enter the new name of budget and corresponding fiscal year On the Copy Budget screen. 6. Click on Create Budget. 7. Update the amount of budget as necessary. 8. Click on Save and close to save the budget copy. The budget you created is a copy of the budget you selected with the name, year, and budget amounts that you specified. How to delete an existing budget? While deleting a budget, you must always remember that a deleted budget cannot be restored. So it is suggested to consult some experts before heading with the process. Though you can retain a record of the deleted budget through activity log, it cannot provide you any details about the deleted budget. 3. Choose Delete option from the action column. If you want to recreate the deleted budget, all the information must be re-entered manually. To get assistance while operating budgets, contact QuickBooks support team @ 1 (877) 227 2303.